I'm currently serving on an award committee and can't even let folks know what I'm reading. It is a totally surreal experience because I live, breathe, and talk books. Anyway, not talking about books to my net friends is getting to me so I have figured out what to do. I can talk about picture books and older books. 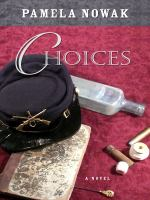 So a recent read I can mention is Pamala Nowak's novel Choices (Five Star, 2009), a wonderful western historical romance set at a fort in South Dakota in the 1870s. I really liked the historical information about the military and especially about military families. I always enjoy books I can connect to personally and the separation between the wives and children of enlisted men and officers really resonated. When we lived on Okinawa, my mother, a brilliant and cultured woman befriended the next door neighbor. They had a lot in common, children of the same ages, an interest in contemporary theater, appreciation for art, and a love of reading, in fact reading and enjoying the same books. The friendship was severed, not because of any antipathy on either of their parts but because it was considered totally inappropriate for the wife of an enlisted man and the wife of an office to socialize. Nowak spoke at the New Castle Library this evening and her research into the customs and mores of life on a military installation in the 1870s was in depth and meticulous. It is amazing to me that mores from the 1870s continued into the 1960s. I wonder if the contemporary military still has the sharp delineation between dependents of enlisted and officers.